The un-predicability of the track at EOS Daun threw up another dramatic final with Joona Haatanen coming out the victor to move into contention for his second overall win of the season. 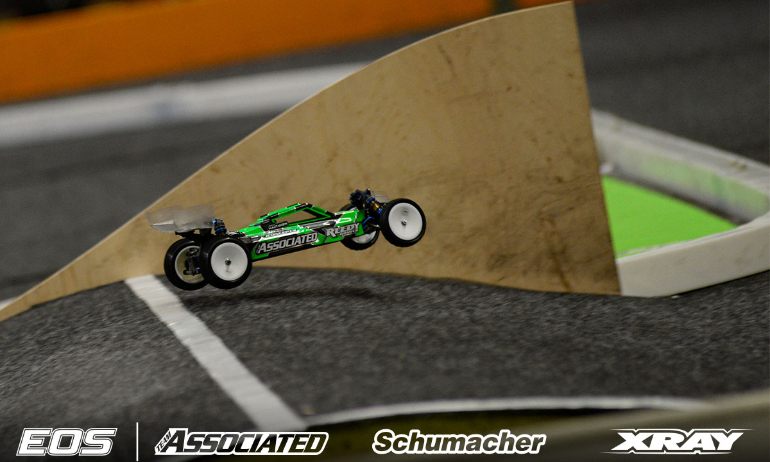 Starting from fifth on the grid, the Team Associated young gun was quickly promoted to the lead going to the front when, on the second lap, Top Qualifier Michal Orlowski and the No.2 Xray of Daniel Kobbevik tangled – rejoining right at the back after the two cars were separated by the marshal. Coming out behind Haatanen would be Joern Neumann and the former champion set about challenging for the lead but after 4-laps it was his turn to be bitten by the track allowing Martin Bayer through but there was nothing the Czech driver could do about the massive gap to Haatanen. Winner of A1 but dropping to last on the opening lap after an error, Lee Martin would recover to finish third after seeing off the attentions of Orlowski. 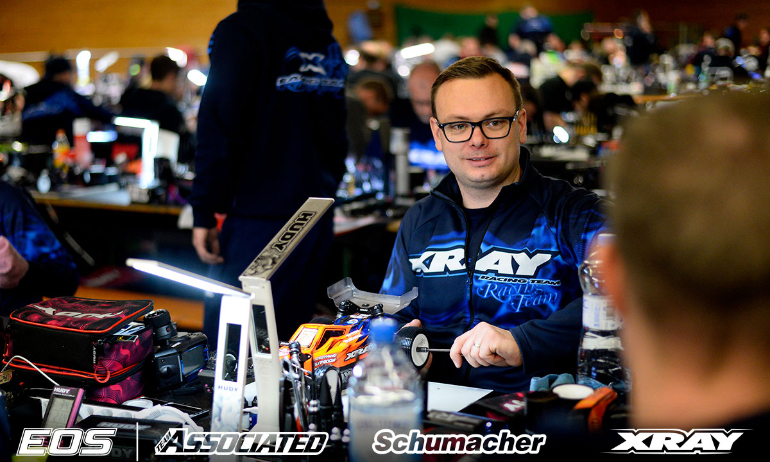 In a repeat of EOS Poland, the reigning champion won’t be converting his TQ into victory as his efforts to get by Martin led to a roll on the last lap which dropped him to fifth and out of contention for the overall win. Reacting to his win, Haatanen said, ‘I don’t know what happened at the beginning but all of a sudden I was at the front’. The 15-year-old added, ‘It was crazy. Cars 5-10 were now at the front and 1-5 were at the back’. 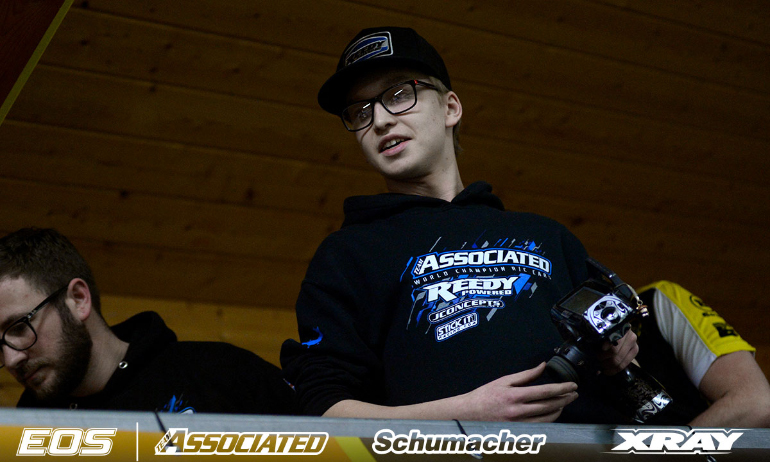 The Finn continued, ‘I was in front of Joern but he had good speed behind me. Then he crashed and Martin (Bayer) wasn’t catching me so I was just driving around’. Looking to A3, the joint points leader coming into the weekend said, ‘I will leave the car the same and just see how the race unfolds’. Feeling a little better than he did in yesterday’s qualifying, Bayer said, ‘I was probably the only one to stay out of trouble. I didn’t actually pass anyone. They just all crashed out of my way’. The multiple EOS race winner continued, ‘there was a big gap to Joona so I settled for second and the guys behind ran out of time to catch me’. Despite his P2 which puts him 3rd in in the points going into A3, the Xray’s Offroad designer concluded, ‘I don’t think a podium is possible. The points are very tight’. 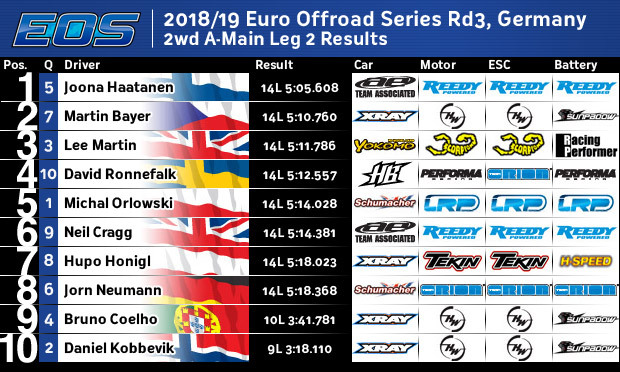 As it stands Martin, Haatanen, Bayer, Kobbevik and Coelho all have the potential to take the overall win on a track that has proven tricky. ‘I made the best of a bad situation’, was how Martin summed up the race. 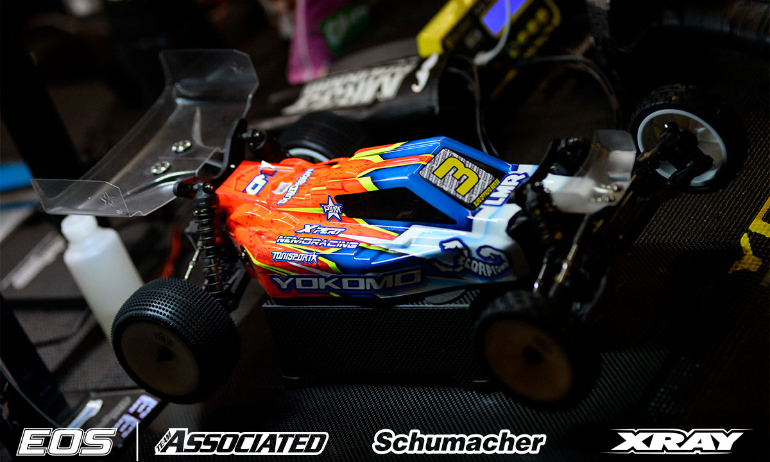 The Yokomo driver explained, ‘I was on new tyres and the car was edgy at the start and this made me more nervous on the first lap causing me to clip the pipe on the wall. I dropped back to last as 7 cars went by before the marshal could get to me’. He continued, ‘to get from 10th to 3rd was a victory. 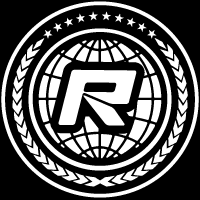 Now my tyres are bedded in it’s all to play for in the last one’.